I’ve been working at mowing the embankment behind/beside (take your pick) the shop yard. Prior to that I let Janet (new foster dog) out to play with the others. As usual, Cochise hid inside while Blondie and Janet roughhoused. I watched for a while: they were not being too rough so I left them to play and went inside to set up race recordings for the next few weeks. I left the door open, and the hooligans raced in and out and round and round. On my wooden floors it sounded like a horse track. 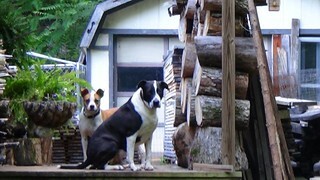 From left: Janet, Cochise, pile of logs. They were very good together. Quite calm. They walked around and explored things – together – at one point they did a little trotting, but mostly they sat on the dock and watched me work. I went out the wooden gate and did the edging along the upper driveway and the side yard. After I put the mower away and went back to the shop, both dogs were laying in the rocks by the pen gate watching to catch glimpses of me. Very calm and peaceful. He went, they bothered him. So he told them off. Not barking, but speaking; loudly and firmly. With lots of growling. Cochise is quite a [talker]. Blondie laid down on the floor beside me. Janet left the room. I expected she’d come right back to roughhouse some more, she always did. Except this time. So, I went to see where she’d gone and what she was up to. No sign of her inside. I stepped outside and called her. She trotted around the far corner of the porch: covered in mud. She’d been laying in the muck under the porch. It’s cool there and she’s a mudder. Fortunately she has short fur so once it dries the mud brushes off easily. Blondie and Cochise went back inside, Janet went back under the porch and that’s where everyone has been. I don’t know what he said, but Referee Cochise definitely threw a flag on that play! Allan, this is a very heartwarming tale. What good companions your dogs must be. Our Mickey, a part German Shepherd/Husky/maybe wolf? mix, used to stand on a hill outside our house and howl when we left. The neighbors were kind enough to inform us of that. Apparently it was the wolf in him, his daddy, I heard, as his mother used to run off into the hills frequently and came back preggers one day. After good ol’ Mickey passed away into the great wilderness in the sky, we got a little black and white border collie who, oddly enough, was not good with herding cows, so his stay was short-lived. 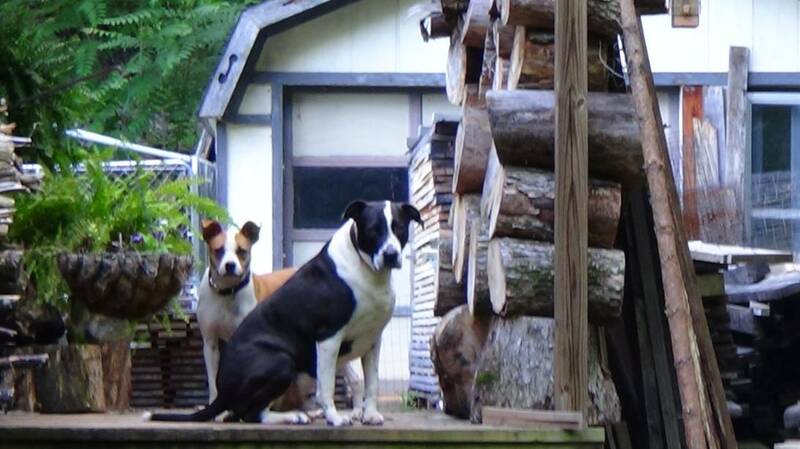 Our dogs were working dogs. My brothers used to take bones out of Mickey’s mouth and chew on them for a while then return them. We weren’t too closely supervised. It sounds like Mickey must have been a particularly tolerant dog to accommodate your brothers’ (rather disgusting) behavior. Although, I sometimes chew (lightly) on the pig ear treats we give our dogs. But I do so BEFORE giving them to the dogs. Teasing them a little builds anticipation. Our Zadie was a Border Collie and wanted SO badly to herd things. But we have no livestock. So she herded trucks. Scared the living daylights out of us, and flattened the postal carriers tire once. Never could break her of it, but she never was injured by it. Very quick and nimble. Herding bears, however, that was a fatal mistake. Thanks for visiting Kenna. I always enjoy your comments. One thing for sure, with the pals around, it helps minimize any loneliness. That is for sure, Mary. It’s be very lonely out here without them… at least on weekdays. Marie is here evenings and on weekends. Beans and Potatoes: Do Not Do That Again!